My name is Bailey Blue! I’m a male seal point Siamese. I was born on the 9th of July 2011 in the South of France and was destined to become a boat cat. I’m a fearless feline who loves nothing better than a salty sea breeze ruffling through my fur. I enjoy panoramic horizons, inky sunsets, and starlit fishy feasts. I dislike dinghy devils (known to some humans as seagulls I believe) because they’re an annoying nuisance. I live on my beloved boat in a port just outside the ancient city of Rome with two human members of crew. My human ‘mum’ is a cool Cornish lass and my human ‘dad’ is an awesome Irish Aussie. Together we have a shared dream to throw off the bow lines and go cruising. We don’t have a set route as such because we intend to be doing this for a long time so there’s no rush. We’d love to see more of the Med, do the Pacific circuit, the Northwest Passage looks like it would be a pawesome challenge and purrsonally I’d like to head to Alaska to see the bears! It would be nice to think that one day we might even do a circumnavigation but we’re happily going with the flow at the moment. We’ve already made progress since we decided to go for it. To begin with mum and I were commuting between a flat in Nice France and the boat here in Rome Italy and now we’re all happily living aboard full-time. The projects that we’ve been working hard on have all been geared to getting the boat ready for cruising safely and comfortably. Once the cruising kitty and the boat are equally ready we’ll be setting off. Until then we’ll be purring along the Italian coast and islands. I’m very happy you came aboard to say ‘Hi’ please feel free to stick around and enjoy the fun. You can also sign up to stay updated on all my adventures. Bailey, you are a most stunning feline. Looks like you’ve got quite the life! thanks for visiting my little spot on the web! cutest thing on earth! I love your little life jacket! I need to take more photos of my Jack the Cat now! You are really a very cool cat. Me forgot to post here…Mum told me to add a commint…ferst me sayz me iz happy we iz furendz n seckond ya iz a bery speshell kitteh!!! Thurd we LUBZ ya Bailey!!! You are remarkable Bailey! Take a look at at http://www.martinleman.co.uk and see some paintings of cats and boats. Thanks for liking my blog. You have a new friend in California, Bailey! Ahoy, matey! Great reading Bailey thank you and purrfectly written too ! Make sure your keep pestering Mum & Dad to make that “giant lead for feline kind” and head offshore. I look forward to more of Bailey’s adventures! I am going to have to read all these Blogs to my Kitty Cats!! Hi Bailey, you are lovely and I love cats. Thanks for your visit. Thanks for the like on my blog. I am owned by four cats (Rusty, Elvis, Wilson, and Purrcee). They ran all the girl cats away. They call me “Mr. Human”. Wow, Bailey you are so gorgeous! And brave too! I think my little Harv would run for the hills if he had to go anywhere near the ocean, lol. 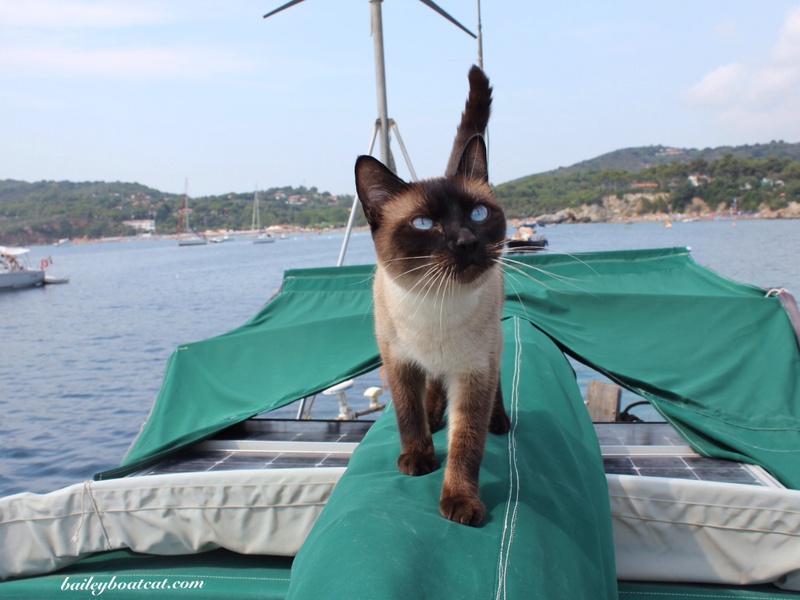 Hello Bailey Blue, thank you for stopping by at trashbus and liking my post “A Cat’s Perspective on Dubrovnik”! I’d be happy if you came back, there are even more stories about cats @trashbus. You are very cute and I will be visiting your blog to get to know you better. Have a nice week, R.
Thanks for the follow Bailey – you are one cool kitty! I would love to take my cat Ollie out sailing with on our boat but when he and the Wildflower met he was a 10-year-old landlubber and too set in his ways. We both look forward to following your adventures though! Vraiment adorable ton blog maritime entre Rome et Nice! Est-ce que tu as lu l’histoire d’Isidore, un chat aussi mignon et sympa, écrite par Françoise Giroud (Histoires presque vraies)? Hi Bailey! I love that photo of you. Your eyes are incredible. I could never get my cats (Cinco and Manna) to wear a cool life jacket like that. 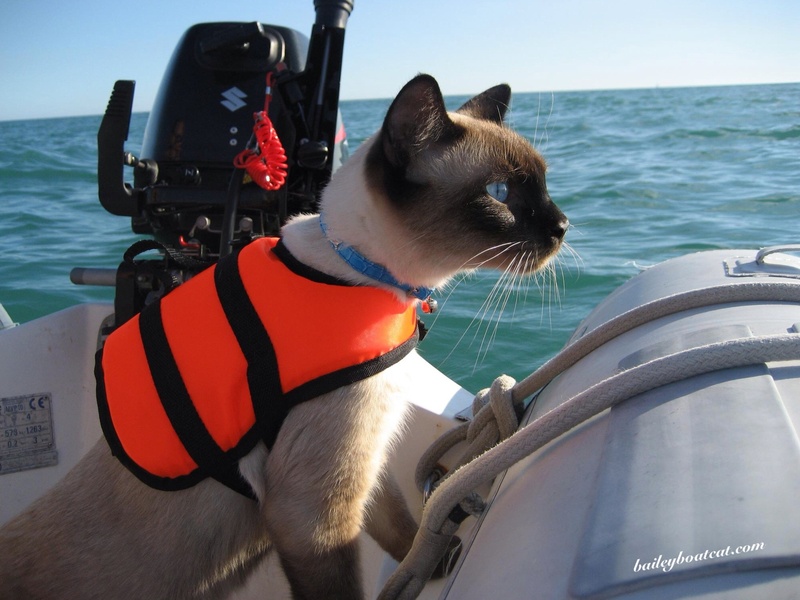 Wow a cat that lives on the water… This is a blog worth following ;)! Nice to meet you! Bailey you’re my hero! I want a poster of you to put on my wall! I’m getting ready to take my cat “Gusters” aboard, and haven’t been able to find a nice PFD like what you wear. Could you tell me the brand, and where you got it? Thanks so much. MOL Brofur Bailey me Mum iz a bit of an ideeot…she thott yer Dad waz Italian…. *shakez head* Poor confuse-ed Mum!!! love u mew mew Baliey… happy to meet u.
I have a feline boat friend too! Captain Nigel Shortbottom doesn’t have his own blog but he is on facebook. Looking forward to reading about your adventures! Just started following your adventures – am thrilled to discover there is a ‘real life Xander de Hunter’. Lively, creative and interesting fiction is it.